Ф. Кулховен спроектировал несколько не самых удачных самолетов, включая двухместный учебный полутораплан FK 32, трехмоторный FK 33 на девять пассажиров (использовался в компаниях "Lufthansa" и "German Aero"), трехместный гидроплан-разведчик FK 34 и двухместную ДальшеMore>>> ультралегкую машину FK 30 Toerist. Следом был разработан трехместный спортивный высокоплан FK 41. Первый FK 41 поднялся в воздух в июле 1928 года. Самолет строился в Голландии серийно в двух вариантах: FK 41 Mk I с мотором Cirrus Hermes мощностью 105 л.с. и FK 41 Mk II с мотором de Havilland Gipsy мощностью 130 л.с. Оба самолета в Великобритании выпускала по лицензии "Desoutter Aircraft Company", всего был построен 41 аппарат. Позже FK 41 получил упрощенное хвостовое оперение. В годы войны самолеты голландской и британской постройки эксплуатировались в Австралии, Бельгийском Конго и в Южной Африке. Силовая установка: один мотор de Havilland Gipsy мощностью 130 л. с. IT is with quite unusual satisfaction that we welcome back into the aviation world one of the most popular pilots of the old Hendon days, Mr. Marcel Desoutter. "Des," as everyone affectionately called him, was famous in those days as a pilot of the Bleriot monoplane, and it was on one of those machines that he had the accident (through the control stick slipping out of his hand while flying low) which deprived him of one of his legs. Actually the accident proved not altogether an evil, for as a result of it "Des" set to work to make himself an artificial leg, and before long he had evolved one which helped not only himself but many others to overcome their disability. In a few years Desoutter had established a famous business producing what is probably the finest artificial leg in the world. After many years Desoutter has "returned to the fold," this time as an aircraft constructor. As a starting point for the Desoutter Aircraft Company, "Des" has chosen the Koolhoven F.K.41 monoplane which was first seen in public at the Rotterdam light 'plane meeting last year. The original machine had a Siemens engine, but the British version will be fitted with a "Cirrus." The first "Cirrus"-engined monoplane was flown over from Rotterdam this week by Capt. Stack, and is illustrated in the photographs above, It will be seen that some slight changes, apart from those relating to the power plant, have been made in the strut bracing of the wing. One of the photographs shows Capt. Stack, Mr. Handsyde (who is works manager), and Mr. Desoutter. The machine, which will be known as the Desoutter monoplane, Mr. Desoutter having acquired the sole British rights for its manufacture in this country, is a three-seater of the conduite interieure type, and is reported to be a very comfortable machine to fly in. The engine cowling shown will, we understand, be altered. All his friends among the older readers of FLIGHT will join us in wishing "Des" every possible success in his venture. IN last week's issue of FLIGHT we were able to publish a few photographs of the new cabin monoplane, which the Desoutter Aircraft Company is placing on the market in a few months' time. Fuller details of the machine have now become available and are given this week, together with general arrangement drawings, sketches, etc. Before beginning the description of the actual machine, it is felt that a few words concerning the newly-formed Desoutter Aircraft Company may be of interest to our readers, as the establishment of a new firm is not yet an everyday occurrence. To begin with, it should be realised that although the company is new, those responsible for its conduct are, in fact, not only old hands in aviation, but may actually be classed among the early pioneers of aviation in Great Britain. Mr. Marcel Desoutter was, as we recalled very briefly last week, one of the most famous pilots at Hendon round about the years 1913-1914, when he was one of the chief exponents of the Bleriot monoplane with Gnome engine. An accident while flying removed him for a time from actual active participation in aviation. While flying low one day, the control stick slipped out of his hands, and before he could get hold of it again the machine had crashed into the ground. Desoutter sustained severe injuries and was in hospital for a very long time. Only the fact that he had a remarkably fine constitution enabled him to recover, but one of his legs had to be amputated. Almost as soon as he was out of hospital Desoutter set to work to make himself an artificial leg, employing Duralumin in its construction, and rubber cord as artificial "muscles," i.e., two aircraft materials. After a certain amount of experimentation Desoutter evolved a leg which was many years ahead of anything else produced, and during the war he built up a very large business in artificial legs for soldiers, the Desoutter leg being extremely light, much more durable, and much more readily fitted to individual needs than any in existence. 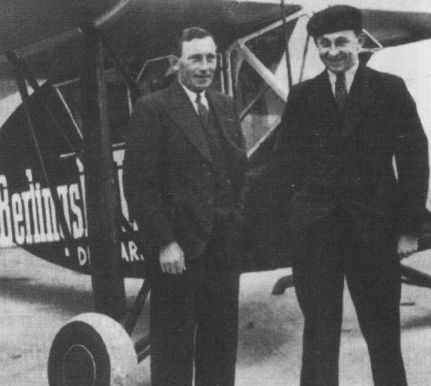 Mr. Desoutter has now, we understand, severed his connection with the company that has become so famous all over the world, and has sold out his interest in it to his brother, Charles Desoutter, in order to devote his energies entirely to aviation once more. Incidentally, it may be mentioned that Desoutter is the sole owner of the Desoutter Aircraft Company, so that in his conduct of the business he is in a much more favourable position than is the average managing director who has shareholders to study. Mr. Desoutter has appointed another "old-timer" works manager. Mr. G. H. Handasyde will be well known at least to the older of FLIGHT'S readers, but for the benefit of the large number of readers whose interest in aviation does not go back more than a few years, it may be pointed out that Mr. Handasyde was, in collaboration with Mr. Martin, responsible for the Martin-Handasyde firm, which produced some very beautiful monoplanes in the years 1911-1912 and onwards, and later became famous as the Martinsyde firm. When the slump in aviation came, the firm was dissolved, and Mr. Handasydes genius as a designer and organiser was lost to aviation for some years. It is, indeed, good news to learn that he has now definitely returned to aviation, and there is a sort of poetic justice in the fact that he has returned in connection with a monoplane, "Handy" having always been a great champion of that type of machine. 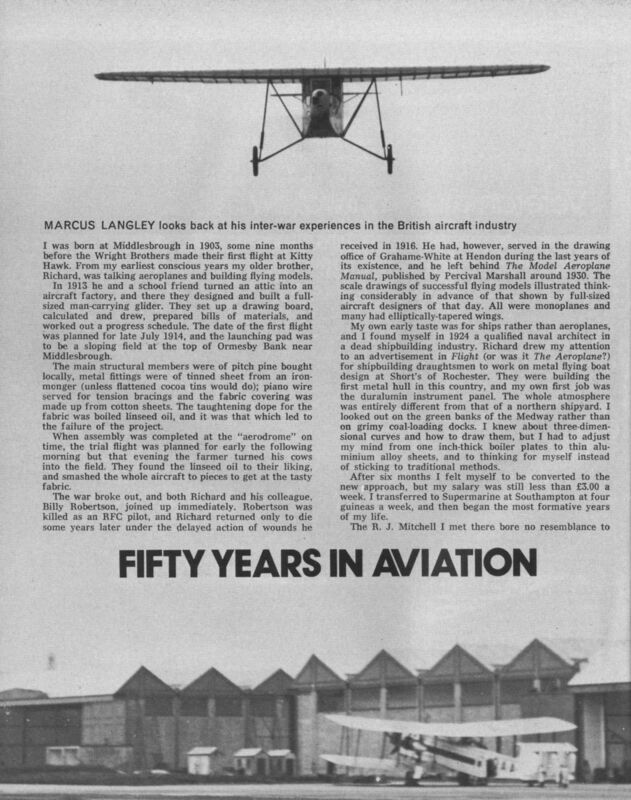 With this brief introduction of the Desoutter Aircraft Company, it should be clear to prospective purchasers that although they are dealing with a new firm, they are, in fact, dealing with men who have a very long experience of aviation, and who bring to their business a very thorough knowledge of all the problems connected with it. This fact should be sufficient guarantee that whatever machines are turned out in the future will be well built and, in addition to complying with all British Air Ministry requirements, will show workmanship of a very high order. Mr. Handasyde, in the old days, had the reputation of putting into his machines some of the very best work which it was then possible to find anywhere in the world, and one cannot imagine that on his return to aviation he would ever be satisfied with anything short of perfection of workmanship. The Desoutter Aircraft Company will, as we mentioned last week, commence operations with the production in quantities of the Koolhoven monoplane F.K.41. Mr. Koolhoven himself was, it will be recollected, chief designer of Armstrong-Whitworth aircraft during the war, and later designed the B.A.T. machines, one of which was the first commercial aircraft to make its appearance in this country. The aircraft slump sent Mr. Koolhoven to Holland, where he has worked since, and produced a number of types. The F.K.41 is one of his latest, and the Desoutter Aircraft Company has acquired the world rights for its construction, and not merely the British rights, as we stated by mistake last week. At the present moment the shops at Waddon are being prepared for the quantity production of these machines, Mr. Handasyde being hard at work designing and building jigs, etc., in order that complete interchangeability of parts may be assured. The machine will, in future, be known as the Desoutter three-seater monoplane, but at present no name for it has been chosen from the innumerable names beginning with "D." As regards price, no definite figure may be quoted yet, but we understand that it is estimated that it should be possible to market the machine at a price which is not much higher than that of the present types of light 'plane two-seater. In view of the comfortable cabin and two seats in addition to that of the pilot, there should be a large demand for the type, not only for use as a private owner's touring machine, but also for air taxi work. Simplicity is the keynote of the design of the Desoutter monoplane, both aerodynamically and structurally. The high-wing monoplane arrangement gives a cabin free of obstructions, while the view downwards and outwards from the passengers' seats is excellent. The three-section windscreen in front, placed close to the pilot, provides a splendid view forward, and even when the tail is down the pilot can look past one side or other of the engine quite readily. It was explained last week that the type of engine cowling shown in the photographs will be altered. At the same time the opportunity will be taken to change slightly the curvatures of the deck fairing in front of the windscreen, thereby further improving a view that is already very good. Certain other minor modifications are now contemplated, mainly relating to the tail and undercarriage, but these will not essentially change the original design. 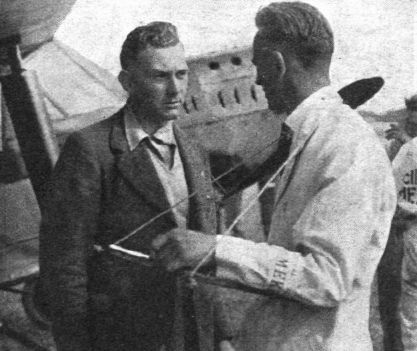 The Desoutter monoplane is of the semi-cantilever type in that the monoplane wing, although having the appearance of being attached to the fuselage and braced on each side by outboard struts, is in reality, structurally, a parasol monoplane carried from points outboard on the wing, and merely located on the fuselage. The weight of the machine is taken on the struts sloping outwards from the lower longerons, and in the centre of the spar there is a fitting, in the roof of the cabin, which permits a small vertical movement of the spar, such as would take place due to a slight deflection under load, but no sideways movement. Thus, as a structure the wing is a parasol monoplane supported on the outboard struts only. This form of support relieves the bending in the centre portion somewhat, while shear loads that arise with other methods of support are also reduced. This feature is one of the most interesting in the fundamental conception of the Desoutter monoplane. The only objection that might be raised is that with a one-piece wing which neither folds nor pivots into a fore and aft position, the hangar space required is somewhat large than would otherwise be the case. There are those who hold that extra strength and simplicity, as well as lower initial cost, of the non-folding wing more than makes up for the possibly slight extra cost of housing. Structurally the Desoutter monoplane is a very simple affair, with wood, and more particularly plywood, forming the chief structural material. Thus the fuselage is a plain box structure covered with plywood, while the wing is a two-spar type, with plywood covering. This type of wing has hitherto been but little used in this country, but the Fokker firm has employed it for a number of years, and their wings have a reputation for durability, so that no trouble should arise on this score. For cheapness of production, it would appear that the wood wings and wood fuselage should have much to recommend them, and in spite of the modern tendency towards all-metal construction, there is probably no very urgent need for this in the smaller types of civil aircraft. For service types the main reason is, of course, the difficulty of obtaining the wood in sufficient quantities in case of war, but the same restriction scarcely applies to a small commercial machine. The Desoutter Aircraft Co. is at present busy building jigs for the production of the monoplane, and once these are in working order it should be possible to produce the machines largely by semi-skilled or unskilled labour, thus keeping the price down. 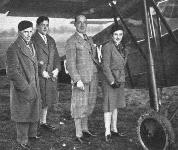 The cabin accommodation of the Desoutter monoplane provides for three occupants. 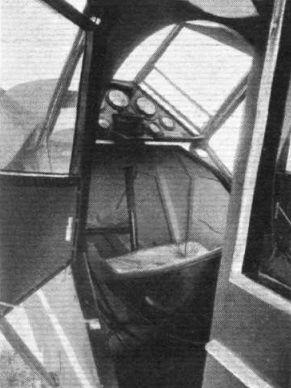 The pilot is placed in front, close to the wind-screen, his seat being provided with a hinged back rest so as to facilitate getting in and out. Behind him is a seat for two passengers. 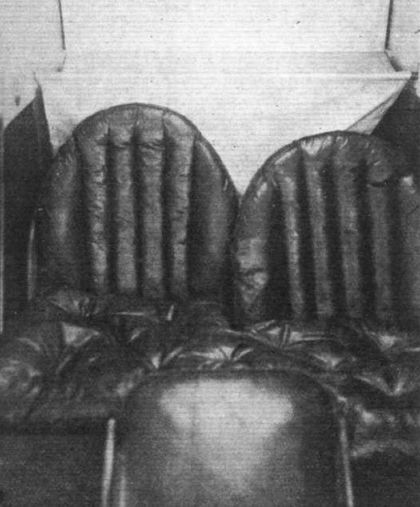 This seat is of the "deck chair" variety, consisting of three tubes carrying a canvas strip. At first this type of seat gives an impression of being somewhat primitive. Actually it is extremely comfortable, even for prolonged journeys, and it further has the advantage of being both light and cheap. The side windows, as already mentioned, give an excellent view. In the roof there is a ripping panel. At present this is in the form of doped fabric, but as this has a tendency to "drum" rather loudly, it will be replaced, in the production machines, by a celluloid panel. The "Cirrus" engine is mounted on a tubular structure attached to the sloping fireproof bulkhead, and it is noticeable that large bearing areas are provided everywhere. Rubber pads are interposed between the engine feet and the tubular bearers to reduce the amount of vibration transmitted to the cabin. There are two petrol tanks in the wing, one on each side of the fuselage, the pipes being led along the outside of the cabin and past (not through) the fireproof bulkhead to the engine. Gravity feed is, of course, employed. The total capacity of the tanks is 26 gallons, 13 in each tank. One of our photographs shows the "nose" of the machine, and it will be noted that with the tail lifted to a horizontal position the engine is low enough over the ground to enable inspection and adjustments to be made without the use of trestles or platforms. The undercarriage of the Desoutter monoplane consists of three struts, of which two form an approximately horizontal vee hinged to the fuselage, while the vertical member, which runs to the wing, is telescopic. The wheel track, it will be observed, is unusually wide, and it should be possible to handle the machine on the ground and taxi it about in a strong cross wind without any difficulty. Of somewhat unusual design is the tail, in which the fixed tail plane is carried at the top of the fin instead of, as is more usually the case, resting on the fuselage. The object has evidently been to get the tail and elevator clear of the slip-stream and down-wash, and should result in making the machine very easy to fly, as the change from engine on to engine off, and vice versa, should cause little change in trim. On the other hand, it might be expected that it would take rather longer to get the tail to lift during a take-off, and we understand that possibly the tail will be slightly modified. The tail skid has its telescopic member housed in the rudder, with which it steers. The tail plane is adjustable on the ground but not in flight. 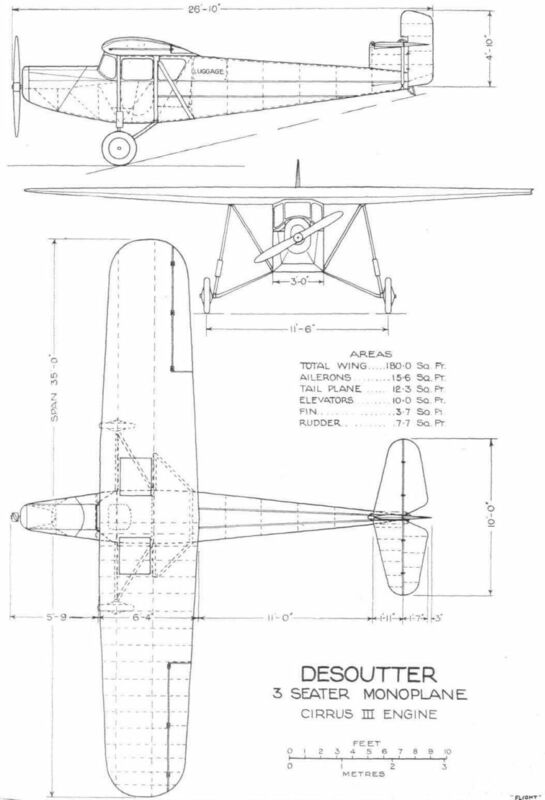 The main dimensions of the Desoutter monoplane are shown on the general arrangement drawings. The tare weight is just under 1,000 lbs., and the C. of A. gross weight is 1,650 lbs. As the wing area is 180 sq. ft., the wing loading is 9-17 lbs./sq. ft. The wing section is of the high-lift type, so that the landing speed is probably quite low, something like 40-45 m.p.h. Over a measured course in Holland the machine was timed to do a speed of 101-5 m.p.h., but as the propeller is not considered to be quite suitable, it is likely that a slightly higher top speed will be attained. The cruising speed is about 85 to 90 m.p.h. Altogether the Desoutter monoplane is a very welcome addition to the British industry, and should find a ready sale not only in this country, but also in the Dominions and abroad. MR. MARCEL DESOUTTER, the founder and sole owner of the Desoutter Aircraft Company, is by way of being one of the pioneers of British aviation, in that long before the war he was one of the famous band of pilots who, in those days, did their best to make Britain "Air-minded." As a result of an unfortunate accident, Mr. Desoutter lost one of his legs, and later, with his brother Charles, established a large business for the manufacture of artificial legs. Mr. Marcel Desoutter has now returned to aviation by forming his own company, and has chosen as a starting point, so to speak, the Koolhoven monoplane F.K.41, for which he has secured the world rights. At Olympia, the first of the British-built D.A.C. sports coupe monoplanes will be exhibited, and doubtless will attract considerable attention, not only because of the old-time connection of Mr. Desoutter with British aviation, but also on account of the many interesting features of the machine itself. Fitted with a "Cirrus III" engine, the D.A.C. 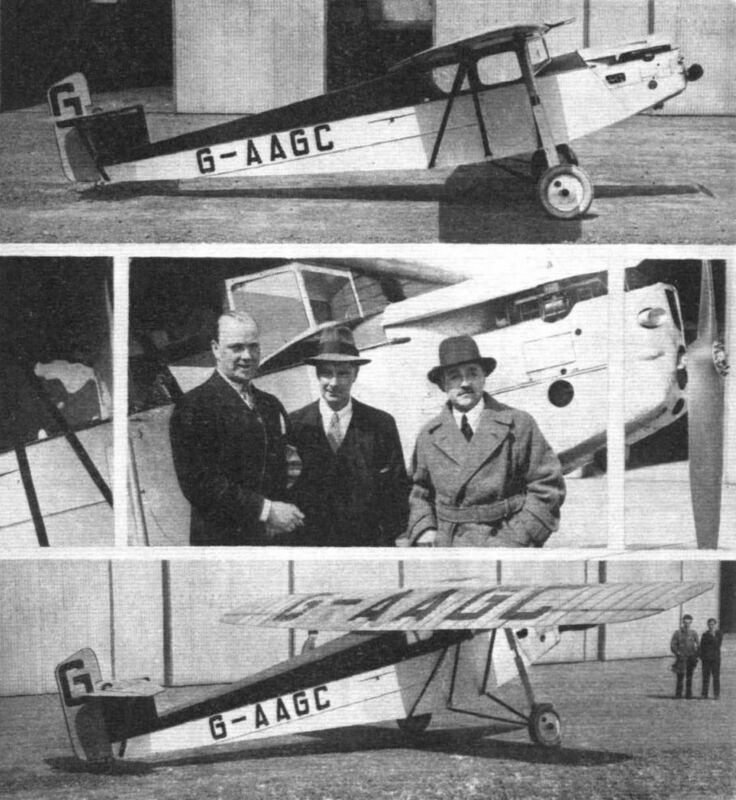 Sports Coupe is a three-seater monoplane admirably suited to the needs of the private owner pilot who wishes to be able to take two guests with him for a flight, or to the company which contemplates running air taxi services, or finally, to the operating company working "feeder lines" connecting up with main air trunk routes. To all these, the D.A.C. Sports Coupe should be of potential interest, in that it is a machine which is inexpensive in first cost, and the operation and maintenance cost of which should be low, bearing in mind the simple forms of construction employed and the, relatively, low power of the engine installed, which represents, when the machine is used for taxi or "feeder line" work, a power expenditure of but 40-45 h.p. per paying passenger. In spite of this, however, the performance is quite good, with a top speed of rather more than 100 m.p.h. The private owner-pilot, who desires, on occasion, to be able to take with him two friends, instead of one, will also find in this machine a mount which enables him to do so at very little greater cost than he has been accustomed to pay for a two-seater. Finally, the D.A.C. Sports Coupe offers the comforts of an enclosed saloon, avoiding the need for pilot or passengers wearing special flying clothes, while the low position of the fuselage over the ground makes the machine particularly easy to enter and leave, no steps being necessary. The D.A.C. Sports Coupe is of all-wood construction, the fuselage being a semi-monocoque structure with a light internal framework covered with plywood. This type of fuselage has proved itself very light, durable and easy to maintain, while repairs can be made by almost any carpenter, should the need arise. In the centre, the fuselage is very deep, and extends, in fact, right up to the rear spar of the wing. 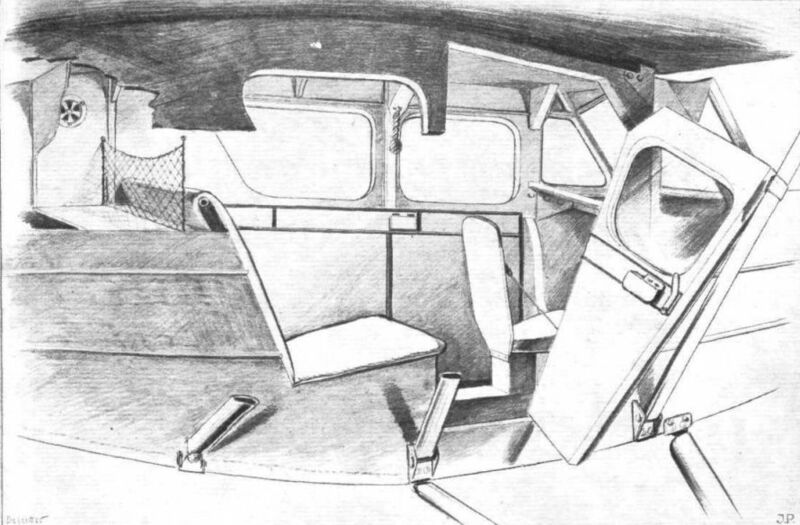 Forward of the saloon, however, the depth is decreased so as to provide forward view through the large windscreen. Flutings formed in the deck fairing and in the engine cowling assist materially in enabling the pilot to look "past" the engine on either side, while side windows in the saloon provide lateral view for all three occupants. The monoplane wing is an all-wood structure composed of two main box spars carrying former ribs, also of wood, the whole being covered with plywood. The wing is built in one piece, and if the internal structure of wing and fuselage is carefully examined it is found that the fuselage is, in fact, suspended mainly from points outboard on the wing, via the sloping lift struts. This rather clever arrangement, into the technical details of which we cannot go here, has the effect of reducing the stresses in the wing spars a good deal. The wing is located on the fuselage by a central fitting so designed as to allow the wing centre to deflect slightly under load, but preventing the wing to shift from side to side in relation to the fuselage. The undercarriage is of exceptionally wide track, and should effectively prevent the machine from turning over on the ground, even in a very strong cross wind. The telescopic legs of the undercarriage are anchored at their upper ends to the wing spar at the points where the lift struts are attached. The saloon has, as already mentioned, accommodation for three occupants. The pilot's seat is in front, just behind the windscreen, while the two passengers are placed behind him, in a deck-chair type of seat, which combines to a remarkable degree comfort and lightness. In the upper portion of the fuselage, just behind the saloon, is a luggage locker for suitcases, etc. 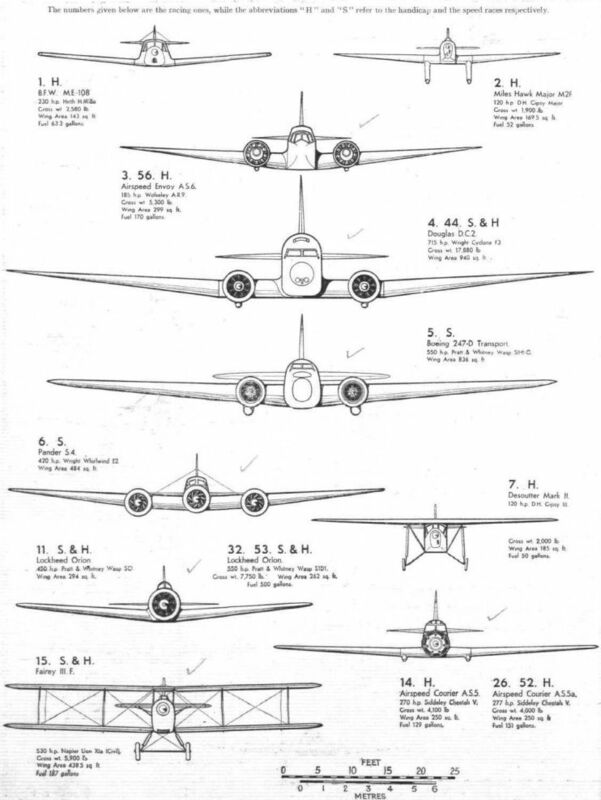 The main dimensions of the Desoutter Sports Coupe are: Length, 27 ft.; wing span, 35 ft.; wing area, 180 sq. ft. The tare weight of the machine is in the neighbourhood of 1,000 lbs., and the Certificate of Airworthiness covers a maximum gross weight of 1,650 lbs. The petrol capacity is 26 gallons, contained in two tanks of 13 gallons each, housed inside the wing, one on each side of the fuselage. 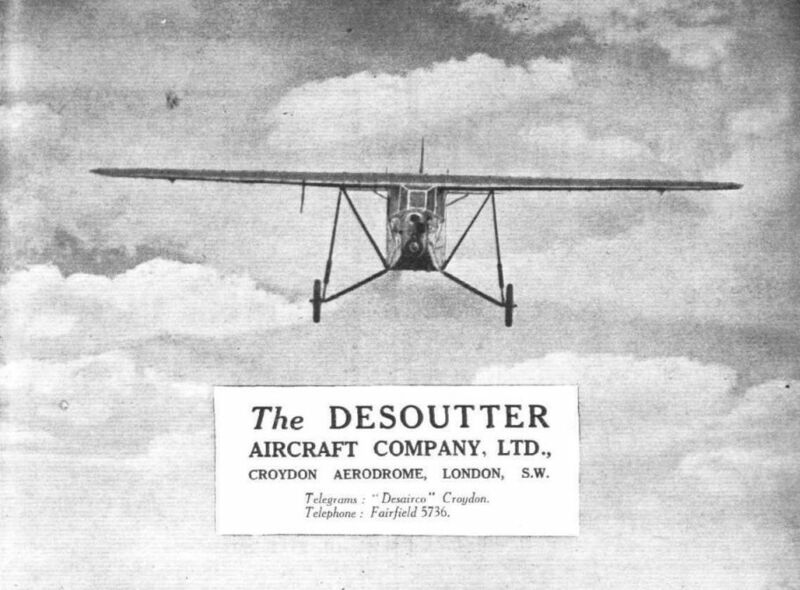 THE Desoutter is the only three-seater cabin machine of its type being built in this country. Originally this machine was the Koolhoven F.K.14, and was built in Holland by Mr. Koolhoven, but Mr. Desoutter realised the opening there was over here for such a machine and bought the manufacturing rights. His factory, the Desoutter Aircraft Works at Croydon, is now, in consequence of his foresight, a hive of industry, and a large number of these machines have already been turned out. For the man who requires an aircraft which is comparable to a saloon car the Desoutter is ideal. 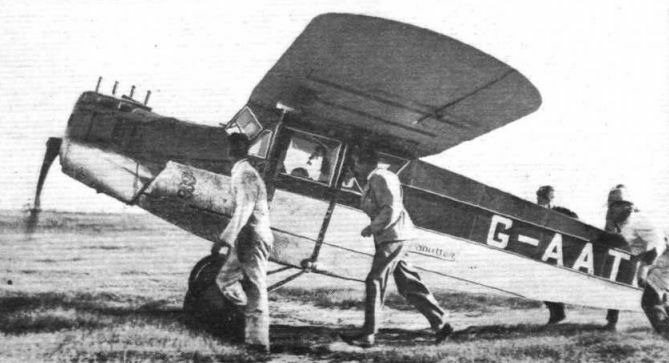 Three people are carried; the pilot in front and the two passengers behind him in comfortably-padded seats, as can be seen in the photograph below. There is no doubt that for general private flying the closed cabin machine is the type which will ultimately become quite common, and those who have experienced the delights of being able to step straight into the machine without any special clothing, knowing that they will be warm and dry, will not want to revert to the open cockpit type of machine. The Desoutter is also being used by several concerns as a taxi machine where the demand is for one to carry just two passengers. The general lines are somewhat reminiscent of the Fokker machines. The wing is in one piece and is ply-wood covered, there is an attachment to the fuselage either side by the top longerons, but these points are only for registration, and do not take any stresses at all, as all the flying loads are transmitted to the main spars via the wing struts. This method effects a considerable economy in the spar strength, which can be taken advantage of in the design of these members. The engine now fitted as standard is the Cirrus-Hermes, and with this engine the cruising speed is about 100 m.p.h. An additional recent refinement is the folding front windscreen, which allows the pilot to look behind him before taking off. One of our photographs shows this clearly. 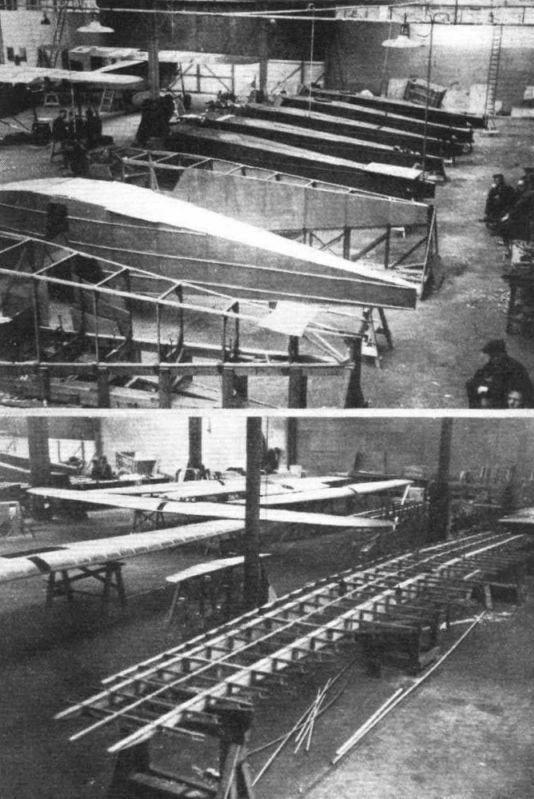 The fuselage is entirely of wood, with a fairly light internal structure and a ply-wood covering which makes it a very light and yet at the same time a very strong form of construction, and moreover has the added advantage that small repairs can easily be carried out by any good carpenter. Luggage accommodation is provided for under the passengers' seat and also behind them in a special compartment. The undercarriage has an exceptionally wide track, which makes the Desoutter very stable on the ground, and there is no tendency to turn over in a cross-wind. SHEER bad luck prevented the new Desoutter monoplane, Mark II, from doing justice to itself in the race for the King's Cup on July 5. After averaging a speed of 120-5 m.p.h. from London to Manchester, the machine ran into a hedge and damaged its propeller enough to put it out of the race. But for this mishap - one of those that might befall any machine and any pilot, and which in no way detracts from the merits of the machine – the Desoutter can reasonably be assumed to have had a fair chance in the race. As it was the first appearance of the machine in public, it was regrettable that it did not finish the race. However, there is consolation in the fact that the failure was due neither to machine nor engine. The Desoutter, Mark II, is in all essentials identical with the Mark I, which has proved so successful. It shows the same form of construction, generally speaking the same aerodynamic characteristics, and finally it will sell at almost the same price as the older model. Certain modifications have, however, been made which have greatly improved not only the appearance of the machine, but also to a considerable degree its performance. The main changes made in the design of the Mark II are : The fitting of an inverted engine, the narrowing of the nose of the fuselage, taking about 6 in. off the fuselage depth without reducing the sitting headroom, and the redesigning of the ailerons and tail surfaces. Of other improvements which, however, will be optional and at extra cost, mention may be made of the fitting of wheel brakes. (Had these been fitted on the King's Cup machine, the mishap might have been avoided). 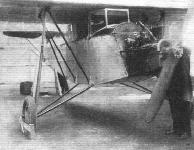 The Desoutter, Mark II, is a full-cantilever monoplane (the wings do not fold), mainly of wood construction. The fuselage is built up of a light framework covered with plywood, and the wing, of the simple two-spar type, is also a framework of wood covered with plywood. The manner in which the fuselage is suspended from the wing is unusual, and as it is not very obvious from an external examination of the machine it might readily escape the notice of a casual onlooker. In effect the fuselage is suspended from the wing not at the top corners of the fuselage, as is usually done, but from the points outboard on the wing at which the steel struts are attached to the spars. In the earlier model the wing was located in relation to the fuselage by a fore-and-aft horizontal bolt free to move slightly up and down in a vertical slot, on the centre line of the wing. In the Mark II machine a somewhat different system has been adopted, details of which are shown in one of the sketches above. Steel fittings on the spar project down below the level of the covering, and carry small transverse bolts with washers on one end. These bolts can be adjusted by means of locknuts and secured in any position, leaving just sufficient gap between the washer and the side of the fuselage at the top longeron. With one of these fittings on each side, the central portion of the wing is free to deflect slightly under load, but the wing as a whole cannot shift laterally in relation to the fuselage. By having the actual wing supports outboard, the load distribution in the spars becomes more economical and weight is saved. The alterations in the design of the fuselage of the Desoutter Mark II affect the performance and appearance of the machine, but not the structural principles involved, which remain the same as in the Mark I. The fuselage depth has been reduced by 6 in., the bottom having been raised by that amount. This has not reduced the headroom in the cabin as far as sitting is concerned. It merely means that the seats are placed lower over the floor. The general effect on the appearance of the machine is quite pronounced. The Mark I Desoutter rather gave one the impression of a fuselage too large for the size of the wing. In the Mark II this impression has quite disappeared, and the fuselage looks quite slender, surprisingly so in view of the fact that the amount of reduction in the depth is but 6 in. 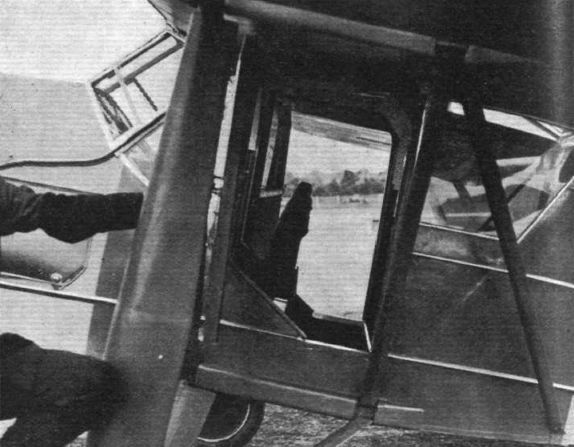 The cabin accommodation itself has been but little altered, the pilot still being seated in front and the two passengers behind him, side by side but very slightly staggered in relation to each other. The nose of the machine has, however, been narrowed considerably as a result of the fitting of an inverted engine, and the windows and windscreen have been extended downwards accordingly, so that the view is much improved, being in fact extremely good. The cantilever monoplane wing remains practically unaltered, but the wing tip has been given a slightly better shape, and the ailerons are of narrower chord, or rather they are now parallel, whereas in the Mark I they were of greater chord at the root than at the tip. This change has made the load on the stick smaller, and the yawing moment is also reduced. Another change in design which has improved the appearance of the machine is that to be found in the tail surfaces. The new tail is illustrated by a photograph, and it will be seen that it is of much better appearance than the old tail. Altogether, the new Desoutter Mark II, is a very pretty machine, and one in which the private owner can legitimately take pride. The new engine installation is very simple and neat. One of our sketches shows the engine mounting, which consists of a welded steel tube structure of extreme simplicity. The cowling over the engine is neat and can be removed in large panels so as to expose the engine installation. With the cowling removed, every part of the installation is readily accessible. 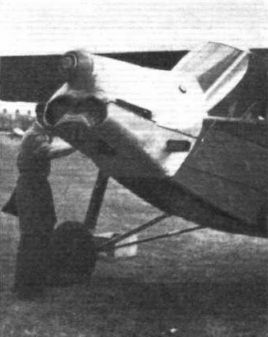 The petrol tank, housed in the wing, has a capacity of 25 or 30 gallons, according to the wishes of the purchaser, and gives direct gravity feed to the engine. With the inverted type of engine a separate oil tank, of 1 3/4 gallons capacity, is carried. The machine entered for the King's Cup Race was fitted with the de Havilland "Gipsy III" engine, but, in future machines the purchaser will have the option of fitting this engine or the new "Hermes" inverted engine. There will be a slight difference in cost between the two types, but this is not likely to be great, and in either case, the machine will be marketed at what must, in view of the great comfort of the cabin and generally high-class of workmanship, be regarded as a very reasonable figure. The equipment supplied as standard includes airspeed indicator, revolutions indicator, cross level, petrol gauge, oil-pressure gauge, and compass. Two suitcases are fitted under the seat, and all three seats have thickly-padded cushions. The standard Mark II will not be fitted with wheel brakes, but these will be supplied to anyone who desires them fitted at a small extra charge. 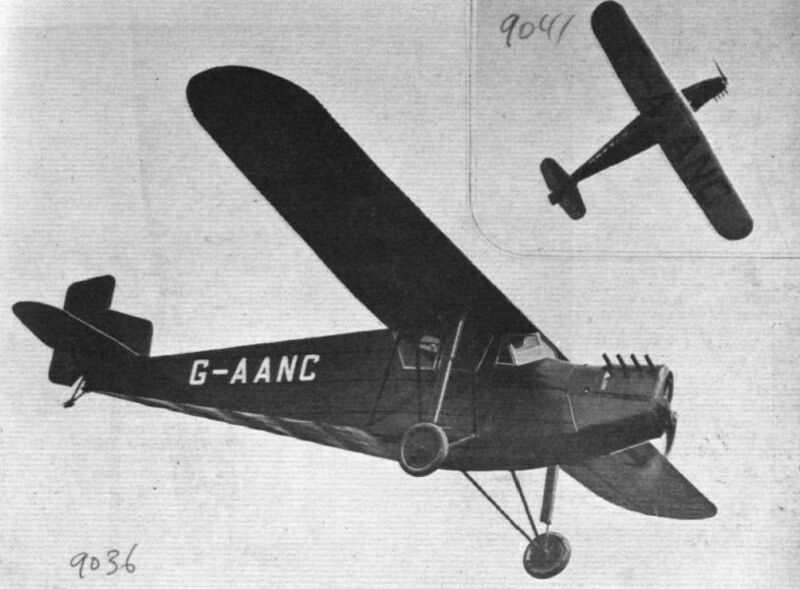 As a machine for the private owner who desires to fly in comfort and without the need for special flying clothes, or as an air taxi machine, or, alternatively, as a machine for “feederline" work to link up with main air lines, the Desoutter Mark II should find a large market not only at home but also in the Dominions. 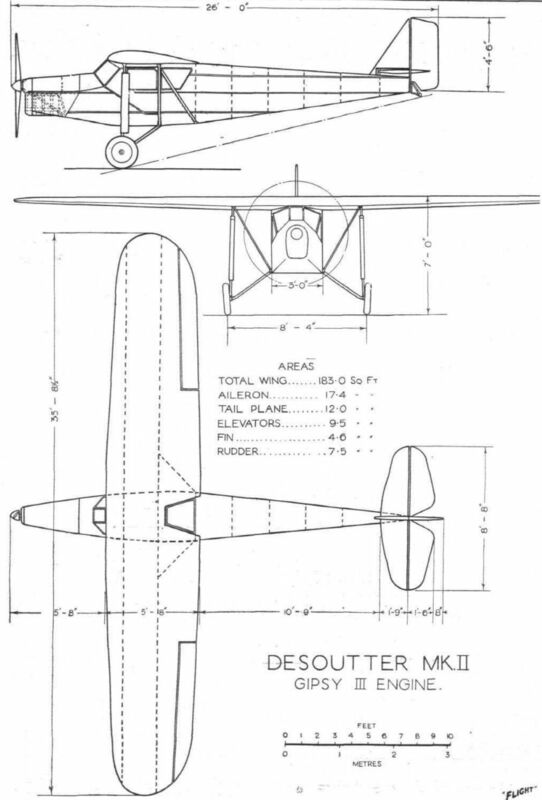 The main dimensions and areas of the Desoutter Mark II are shown on the general arrangement drawings on p. 1013. The tare weight of the machine is 1,150 lb., and the gross weight for C. of A. is 1,900 lb. Thus, at full load, the wing loading is 10-4 lb./sq. ft., and the power loading 15-8 lb./h.p. The normal petrol and oil capacity, giving a range of about 450 miles, account for about 200 lb. of the disposable load. This leaves a useful load of 550 lb. Taking pilot and two passengers at an average weight of 160 lb. each, some 70 lb. is left for luggage, etc. Which means that a private owner can take with him two friends and enough luggage for a week-end cruise at least, while if the machine is used as a taxi, the pay load, for a range of 450 miles, is 390-400 lb., or some 3 1/4 lb. per h.p. As the machine can cruise economically at 100 m.p.h., this must be regarded as a good figure, and a top speed of somewhere in the neighbourhood of 120 m.p.h. should be high enough to satisfy anyone who is not determined to use his machine for racing only. After a rebuild which began in 1985 by members of the Shuttleworth Veteran Aeroplane Society, including Tony Dowson and Ken Hyde, the Collection’s Desoutter I monoplane made its first post-restoration flight on January 26, 1998. SOME AIRCRAFT TYPES AT THE ROTTERDAM MEETING: 3, the new Koolhoven monoplane, type F.K. 41. This is a three-seater touring machine. ECONOMICAL AVIATION: The Koolhoven F. H. 41, although fitted with a Siemens engine of 50 h.p. only, carries pilot and two passengers. The machine is built mainly of wood, both fuselage and wing being covered with three ply. On the right the machine is seen in flight, piloted by M. Van Vloten. GETTING THEM DOWN AT WAALHAVEN: Various styles of landing over the tape are shown. 7. 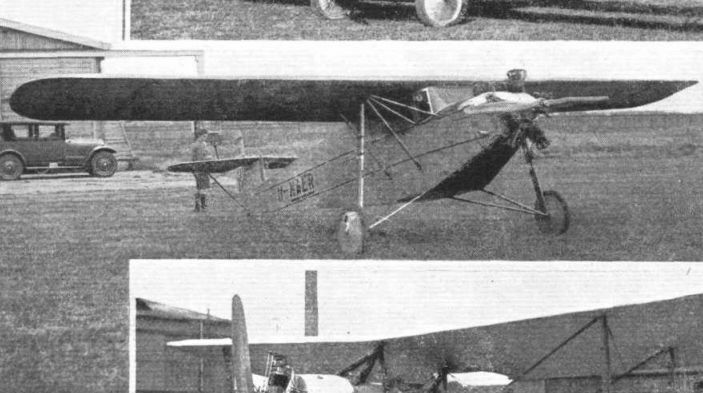 Koolhoven F.K.41. 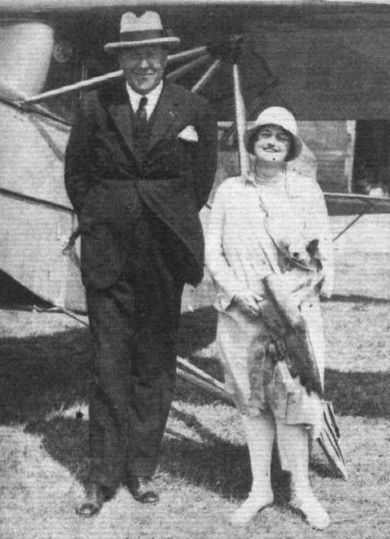 "TINY AND TOT": Mr. and Mrs. F. Koolhoven, standing by the new F.K.41 monoplane. 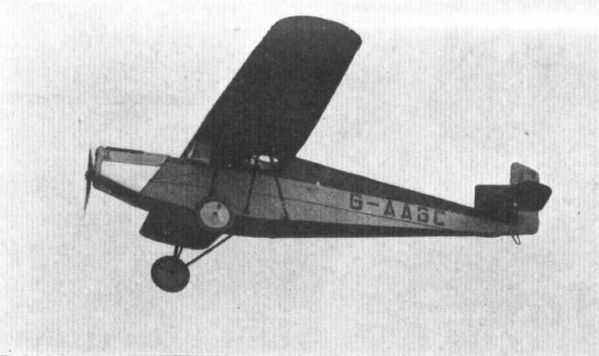 Desoutter I G-AANE, flown by Tommy Nash for joy riding, was owned by Rollason Aircraft Services Ltd based at Croydon. The "Daily Mail" having had a run of bad luck with "Geraldine" have now purchased a Desoutter; no doubt they will be happier with their latest love! FIRST BRITISH "AVION SANITAIRE": A Desoutter monoplane (Hermes) has been fitted up as a Red Cross machine. 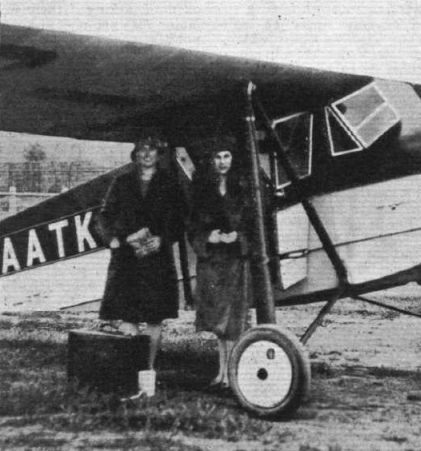 KOOLHOVEN F.K.41 was a three-seater produced in the Netherlands in the late 1920s; also built in the U.K. (about forty) by the Desoutter Company. Normal engine was the Cirrus Hermes I, but VH-ULX (c/ n. 4103, crashed 10th November 1937, Condobolin, N.S.W.) was powered by a 90-h.p. D.H . Gipsy II. Two F.K.41s were on the British Register : G-AAGC and G-AALI (c/ n. not known). 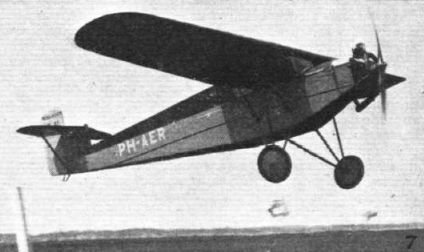 Former sold to S. Africa ; latter "sold abroad " (October 1929) may have become VH-ULX. A PREVIOUS AUSTRALIAN FLIGHT: This illustration may be of interest just now, for it shows the first cabin monoplane to make a flight from England to Australia - the Desoutter ("Cirrus-Hermes") of Flying Officers Piper and Kay, taken on their arrival at Mascot Aerodrome on April 3 last. COMMERCIAL ENTERPRISE: The Desoutter (Hermes) recently delivered to Cirrus Engines, Ltd. This will enable Mr. V. Holman, sales manager, to keep in better touch with all the firm's customers. Mr. V. Holman, who is an experienced pilot, will fly the machine himself. COMMERCIAL PRODUCTION: A batch of Desoutter cabin aircraft ready for delivery at Croydon. LATEST DESOUTTER MONOPLANE: The "D.A.C. Sports Coupe" (Cirrus III). DESOUTTER SPORTS COUPE ("Cirrus III"). FINISHED FLYING: Flight-Lieut. Schofield's demonstrations of aerobatic flying are always characterised by a remarkable "finish." He is here seen flying the Desoutter-Hermes monoplane, and, inset, flying upside down. The Phillips & Powis "Desoutter" (Hermes) piloted by Mr. S. Cliff winning by a short head from Mr. Norman Edgar in the "Elf" (Hermes). One of the "taxis" returning home. 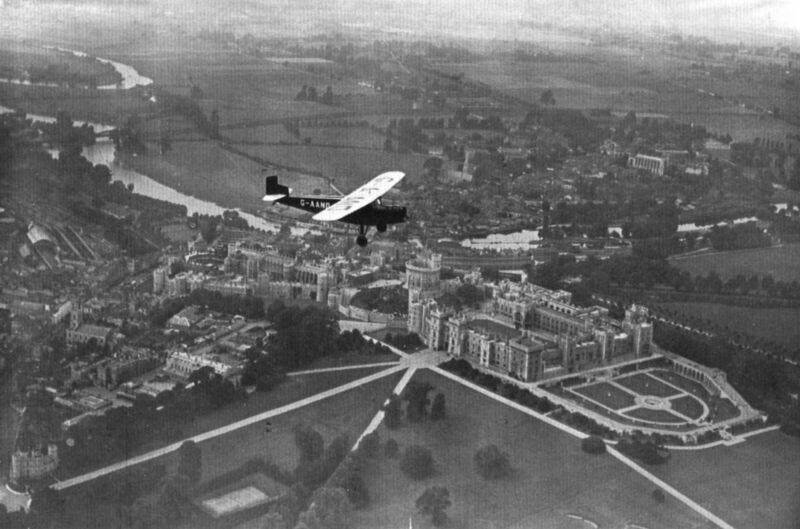 A Desoutter - Hermes over Hanworth. Above are the new workshops which will cater for the needs of the whole of the N.F.S. organisation. Below, two passengers about to "enplane" in one of the new Desoutter cabin machines (with Cirrus "Hermes" engines), which N.F.S. have standardised on their taxi-service. 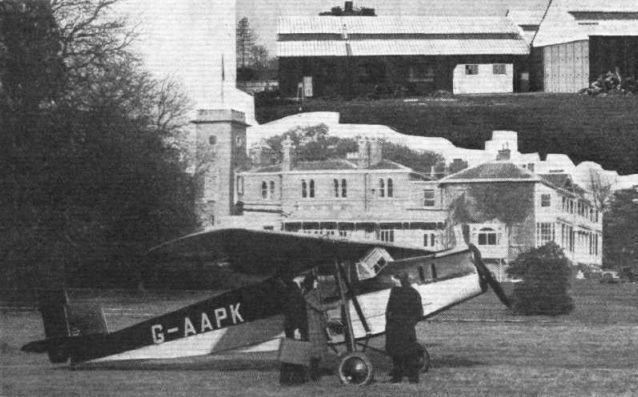 A Hermes-Desoutter Coupe at Hanworth. In front are Capts. Stack, Rodney, Schofleld and Styran of N.F.S. THE ILLUSTRATED PRESS GO FLYING: Our picture shows, from left to right, Mr. A. S. Frene and Capt. Alan Bott (of the "Graphic"), Mr. and Mrs. De Groot (Editor of the "Bystander"), at the Desoutter Sports Coupe demonstration at Hanworth. 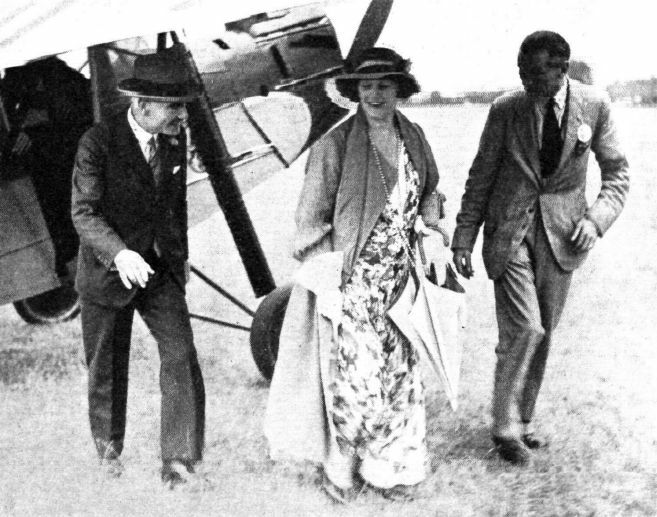 Miss Winifred Spooner with Lady Currie just before their trip to Paris in the Hermes-Desoutter. MUNICIPAL INTEREST: The Lord Mayor of Nottingham (Coun. 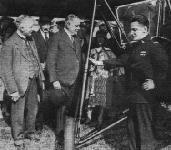 W. Wesson), centre, about to go for a flight in the Desoutter-Hermes limousine piloted by Flight-Lieut. Schofield, right; Mr. Hooley (Sheriff) is on the left. A view (left) of the Hanworth cowling on one of the N.F.S. Desoutters ("Gipsy II"). This new clean design was made by the N.F.S. repair shops at Hanworth Park. On the right is shown another alteration to the N.F.S. Desoutter - the fitting of sliding windows to the passengers' cabin. These can be kept open in flight without undue draught entering the cabin. The Desoutter Sports Coupe. With accommodation for pilot and two passengers this type should be very useful for taxi work, etc. THE DESOUTTER MONOPLANE: The photograph gives a good idea of the low position of the engine above the ground, which facilitates inspection and adjustments. THE DESOUTTER MONOPLANE: The somewhat unusual tail layout is shown. THIS is a recent development of the Mark I machine, and among the changes may be noted the fitting of an inverted engine (Gipsy III), which has improved the view. 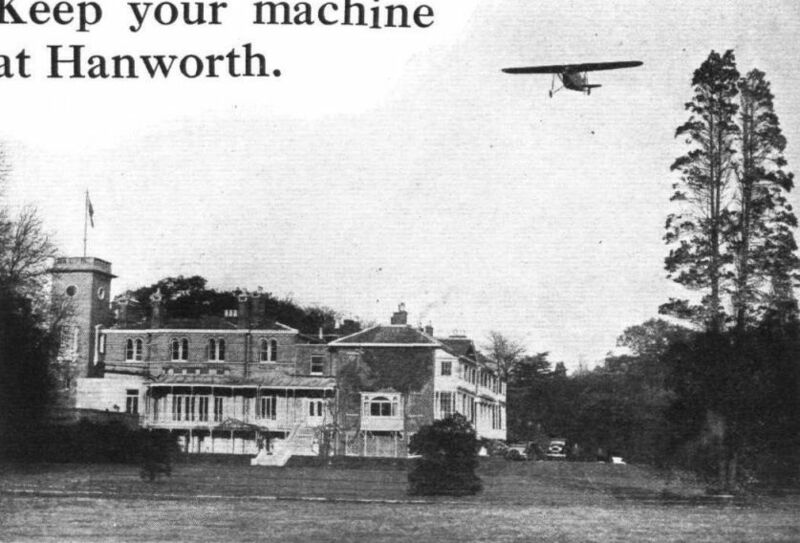 THE NEW DESOUTTER MONOPLANE: The Mark II, with Gipsy III engine, has now been flown at Croydon, and appears to come well up to expectations. The clean nose produced by the inverted engine adds greatly to the appearance of the machine, as does also the new style of tail and slightly shallower fuselage. The new machine is likely to become very popular at the price for which it is to be marketed. 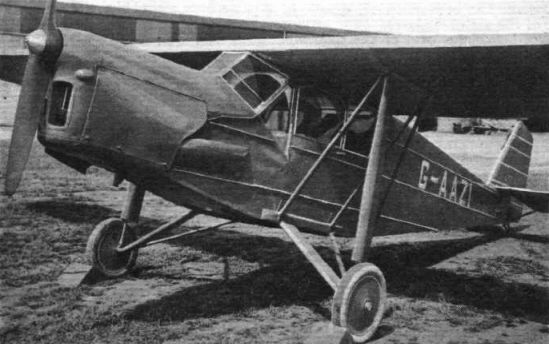 THE DESOUTTER MARK II: Three-quarter Front View. Cabin machines suitable for the private owner: the Desoutter (Gipsy II). THE DESOUTTER, MARK II: Three-quarter rear view. 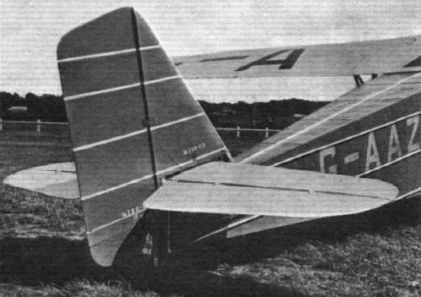 THE DESOUTTER MARK II: Side view. VIEW: This illustration of the nose of the Desoutter Mark II, indicates the excellent view obtained by the pilot in the latest model. The engine is a Gipsy III. Несмотря на "гражданское" происхождение, пять Desoutter Mk I и Mk II британской постройки поступили на вооружение Королевских ВВС. Один из них ныне находится в летном состоянии и принадлежит коллекции Шаттлуорта. 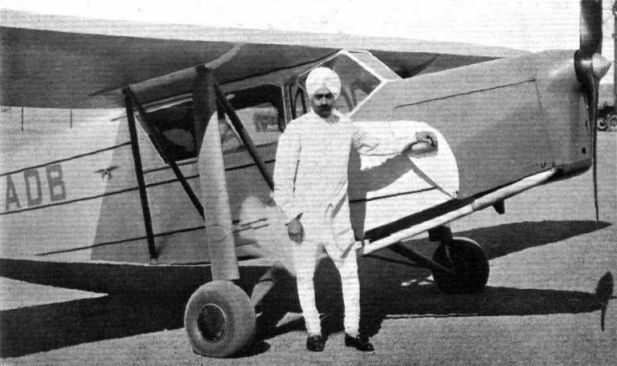 AN INDIAN PRIVATE OWNER: Rai Sahib Gopaldas, W.L.C., Secretary of the Nationalist Reform Party in the Punjab Legislative Council, and his Desoutter monoplane. He is the first private owner in the Punjab Province. 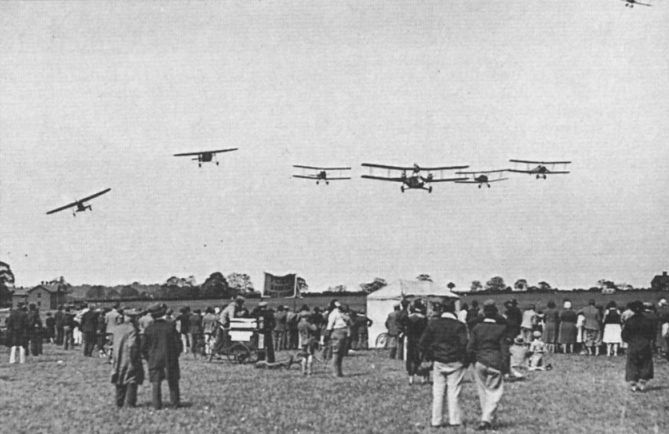 BEDFORD: The line up of demonstration machines, showing Metal Moth (Gipsy I), Puss Moth (Gipsy III). Desoutter II (Gipsy III), Moth (Cirrus III), Avian (Hermes), Autogiro (Genet Major). THE NEW TAIL: The photograph shows the tail of the Desoutter Mark II. The new Desoutter II. Our view shows the large doors on each side. TRYING IT ON THE DESOUTTER. This is the brand new inverted six-cylinder "V" Monarch engine installed in a modified Desoutter for test purposes. The engine, which will be developed by Aero Engines Ltd., delivers 150 h.p. and weighs about 340 lb. The circus comes to yet another town. In this formation, led by H.P. W.10 G-ABMR, are two Gipsy Moths, Comper Swift, Desoutter, Tiger Moth, Airspeed Ferry and a Southern Martlet. Alan Cobham's National Aviation Day display team hits town, led by an Airspeed Ferry flanked by Tiger Moths, Desoutters, a Gipsy Moth and an Avro 504K. THE DESOUTTER FACTORY AT CROYDON: Some of the Machines nearing completion. A VERY COMFORTABLE CABIN: The latest Desoutter, Mark II, has been designed with a view to giving real comfort to the occupants. The pilot's cockpit is roomy and the windows and large windscreen give an excellent view in all essential directions. The Desoutter Sports coupe has seating accommodation for pilot and two passengers. 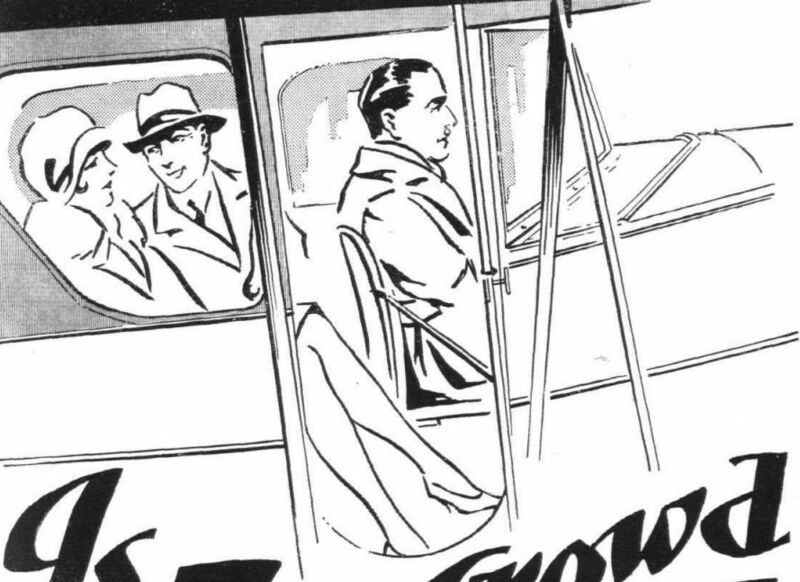 Although simply a "deck chair" type, the passengers' seat is one of the most comfortable in the whole Show. 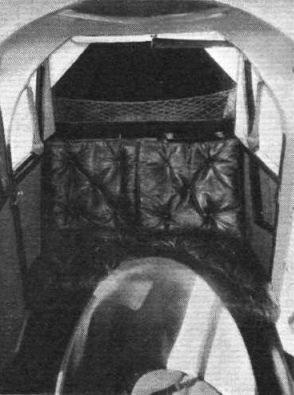 The slightly staggered seats for two passengers are well placed to avoid fatigue, and air cushions help to make a flight of even very long duration less tiring than a train journey. 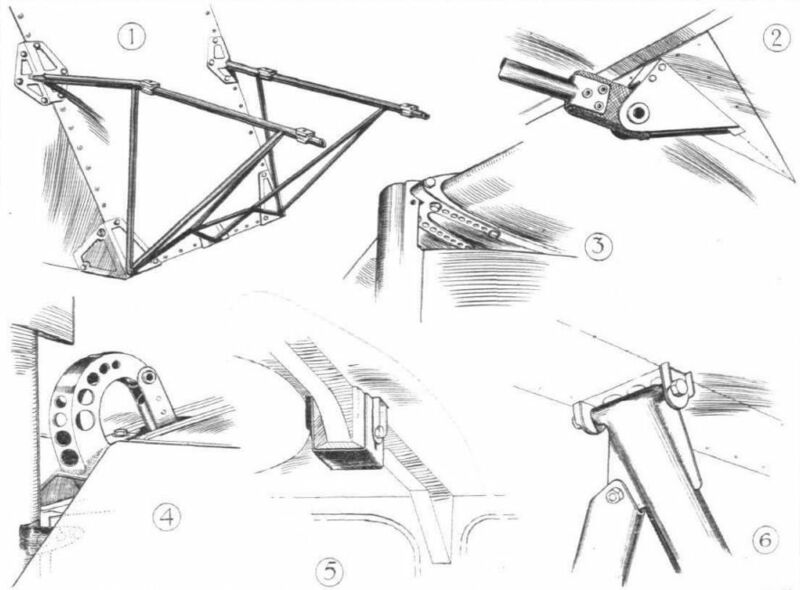 THE DESOUTTER MONOPLANE: Some constructional details. The tubular engine mounting is shown in 1. Note the rubber pads interposed between the engine bearers and the feet of the engine to reduce vibration. A flexible (rubber) connection is made between the aileron crank and its operating tube, as shown in 2. The tail plane adjustment is shown in 3, and the elevator crank in 4. Fig. 5 illustrates the fitting which locates the wing in relation to the fuselage, but which permits deflection of the wing spar. The attachment of lift strut to rear spar is shown in 6. THE DESOUTTER MARK II: On the left the very simple engine mounting, of welded steel tube, and on the right details of the manner in which the wing is located on the fuselage. THE NEW TAIL: On left, the tail incidence adjustment, and, on the right, the bent crank which operates the elevator. The ailerons are operated from the joy stick by a vertical tube and a crank on the spar. The crank, and its inspection door, is shown on the left. On the right, details of lift strut attachment to spar.